Are HERBS an effective way to support your immune system and inflammation? Nearly one-fourth of the drugs prescribed all over the world are originated from plants! Of the 252 drugs considered as basic and essential by the World Health Organization (WHO), 11% are exclusively of plant origin and a significant number are synthetic drugs obtained from natural precursors. Examples of important drugs obtained from plants are digoxin from Digitalis spp., atropine from Atropa belladonna, and morphine from Papaver somniferum. It is estimated that 60% of anti-tumor and anti-infectious drugs already on the market or under clinical trial are of natural origin. The vast majority of these cannot yet be synthesized economically and are still obtained from wild or cultivated plants. This branch of medicine is called herbal or botanical medicine, which refers to the use of plants for medicinal purposes or as health supplements. It may involve plant’s seeds, berries, roots, leaves, bark, flowers, or any part of the plant for medicinal purposes. It is the oldest and still the most widely used branch of medicine all over the world. It is unknown precisely when people started herbal medicine, yet evidence shows that humans were using medicinal plants 60,000 years ago. Sumerians, ancient Greek, and Egyptian writings depict medicinal uses for plants. Indigenous cultures (such as African and Native American) depended on herbs for their healing rituals, while other cultures developed traditional medicine (especially Indian and Chinese) in which herbal treatments were used. When it comes to advantages of herbal medicine, it is more affordable and easily obtainable than conventional medicine, which usually depends on high price technology. Moreover, chronic patients do not have to worry about paying money month after month for their medications. In 2009, a systematic review published in the Evidence-Based Complementary and Alternative Medicine journal determined cost-effectiveness of natural health products. Researchers found that the use of natural health products shows evidence of cost-effectiveness in relation to postoperative surgery but not with respect to other conditions assessed, so natural health products may be of use in preventing complications associated with surgery. 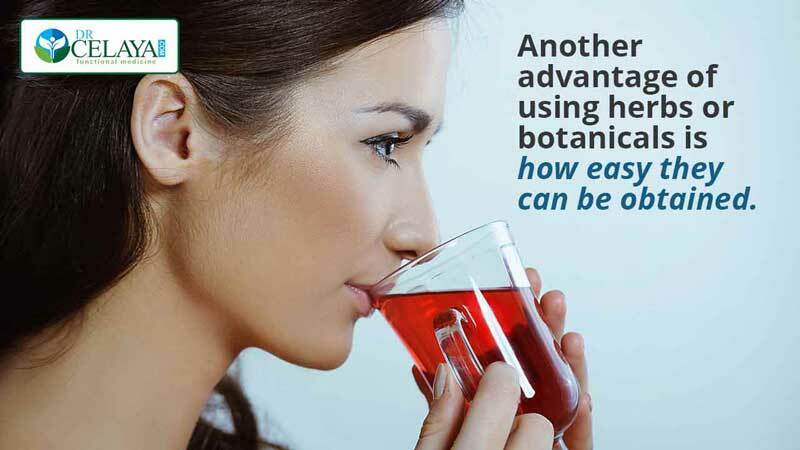 Another advantage of using herbs or botanicals is how easy they can be obtained. Herbal and medicinal food products are readily available in health food and grocery stores, making them simple and easy to get versus conventional medications, which are mostly prescribed after visiting a doctor. Definitely, this avoids additional health care costs. 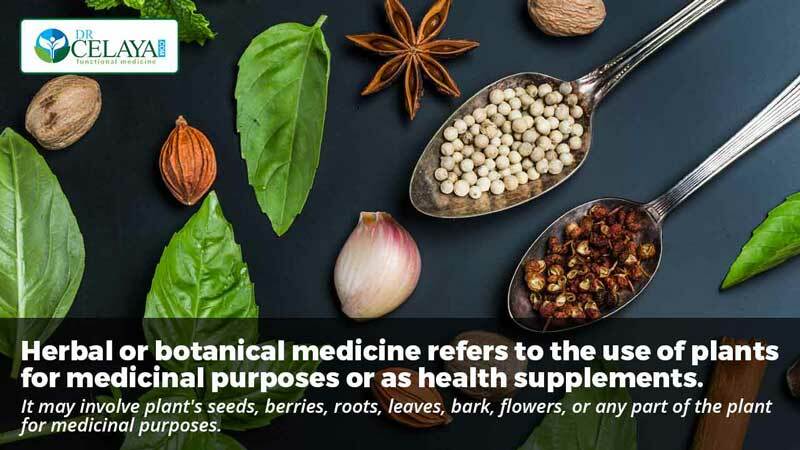 Herbal products are classified as dietary supplements so they can be sold without prior authorization of the Food and Drug Administration (FDA). This makes them easier to purchase. If you would like to talk to Dr. Celaya about your health and reducing inflammation, you can schedule a free 15-minute consultation. 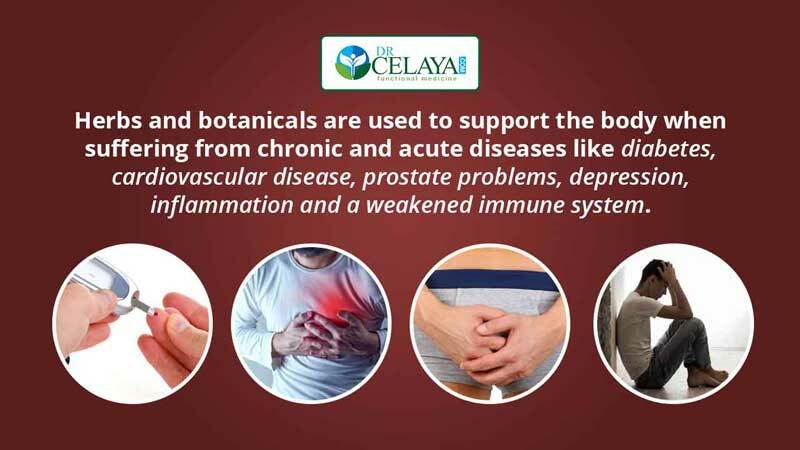 Herbs and botanicals are used to support the body when suffering from chronic and acute diseases like diabetes, cardiovascular disease, prostate problems, depression, inflammation and a weakened immune system. Some of the important medicinal herbs and foods include garlic, ginger and ginkgo biloba. Garlic, for example, contains important nutrients, including manganese, allicin, vitamin B6, selenium, vitamin C, and high levels of sulfur. Consuming cooked or raw garlic can help detoxify heavy metals in the body, improve cholesterol levels, lower the risk of heart disease, reduce blood pressure, boost the immune system, relieve allergies, fight fungal and viral infections, and reduce hair loss. Ginger is considered one of the most widely used spices in the world today. The medicinal effects of ginger come from gingerol, which has highly potent antioxidant and anti-inflammatory effects. Ginger has the ability to improve digestion, relieve nausea, boost immune and respiratory function, fight bacterial and fungal infections, reduce pain, control the aging process, improve diabetes, and may even prevent cancer. According to a study published in the International Journal of Preventive Medicine in 2013, the anticancer potential of ginger is well documented, and its functional ingredients like gingerols, shogaol, and paradols are the valuable ingredients which can prevent various cancers. Ginger can be consumed raw, in powder or supplement form, in liquid form by making a tea, or topically in oil form. 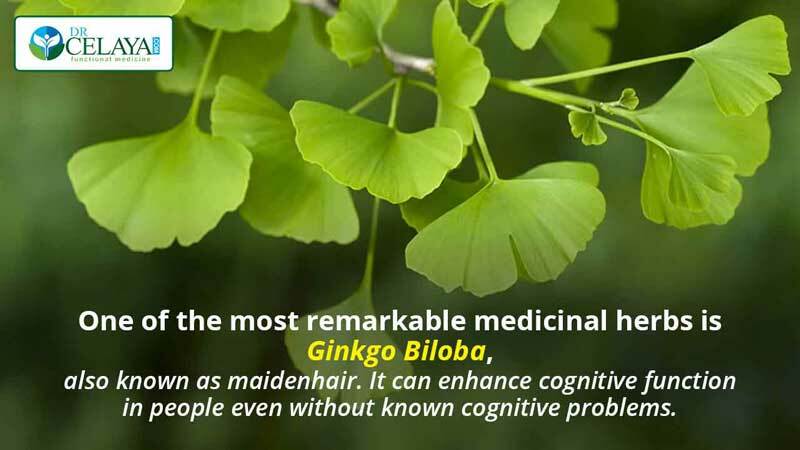 One of the most remarkable medicinal herbs is ginkgo biloba, also known as maidenhair. It can enhance cognitive function in people without known cognitive problems. In 2016, research was conducted to explore the effectiveness and safety of ginkgo biloba in treating mild cognitive impairment and Alzheimer’s disease. The results showed that ginkgo biloba is potentially beneficial for the improvement of cognitive function, activities of daily living, and global clinical assessment in patients with mild cognitive impairment or Alzheimer’s disease. Ginkgo biloba has other benefits such as fighting anxiety and fibromyalgia and improving libido. Ginkgo biloba is readily available in the form of capsules, tablets, liquid extract and dried leaves.